Portraitist Gilbert C. Stuart's depiction of an 1812 Massachusetts redistricting scheme favoring the political party of Governor Elbridge Gerry was the inspiration for the term gerrymander. The process of dividing a particular state or territory into election districts in such a manner as to accomplish an unlawful purpose, such as to give one party a greater advantage. State constitutions or amendments to those constitutions empower state legislatures, and sometimes state or federal courts, to apportion and reapportion election districts. This generally means that states may draw and redraw the lines around election districts for offices ranging from local to congressional. It can also mean that states may calculate and recalculate the numbers of representatives in election districts. Any form of unfair Apportionment may be called gerrymandering, but generally, a gerrymander is understood to be invalid redistricting. Redistricting is usually used to adjust the populations of election districts to achieve equality in representation among those districts. Sometimes, however, it is used for unlawful ulterior motives. Then it crosses the line to become gerrymandering. The classic example of a gerrymander is a legislative redistricting scheme designed to benefit the party in power. Assume that a state legislature has redrawn its voting districts to divide and fold all communities that vote predominantly Democratic into larger communities that vote Republican. This is a political gerrymander. Such redistricting decreases the likelihood of Democratic representation in the state legislature because the Democratic vote in each new district is diluted by the predominant Republican vote. The term gerrymander was inspired by an 1812 Massachusetts redistricting scheme that favored the party of Governor Elbridge Gerry. Portraitist Gilbert C. Stuart noted that one new election district had the shape of a salamander. 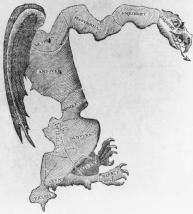 Stuart drew an outline of the district, put a salamander's head on one end, and called the creature a Gerrymander. The gerrymander has been used by state legislatures ever since. It thrived all the way through the 1950s, when many southeastern states were reapportioned in an effort to weaken the voting power of African Americans. This usually involved the drawing of complex, irregularly shaped election districts. A legislature could divide and fold predominantly African American communities into surrounding districts with large blocs of white voters. Such schemes diluted the vote of African Americans, placed their representation in faraway communities, and effectively prevented African Americans from expressing their collective will in elections. In 1960, the U.S. Supreme Court struck down the first gerrymander scheme it reviewed, in Gomillion v. Lightfoot, 364 U.S. 339, 81 S. Ct. 125, 5 L. Ed. 2d 110 (1960). In Gomillion, the Alabama legislature altered the city limits of Tuskegee to remove all but four of the city's 400 African American voters. It changed the city limits of Tuskegee, for election purposes, from a square to, according to the Court, "an uncouth twenty-eight-sided figure." According to the Court, the redistricting discriminated against African Americans and violated the equal protection clause of the Fourteenth Amendment. Gomillion did not establish that the drawing of election districts was always a proper matter for the courts. Before Gomillion, the Court had refused to review gerrymandering claims, holding that the issue of reapportionment was political and beyond the reach of the courts. The Court heard Gomillion only because the issue of racial discrimination lifted the controversy out of the arena traditionally beyond the power of the courts. In 1962, the U.S. Supreme Court took the first step in establishing its right to review all districting, with its decision in baker v. carr, 369 U.S. 186, 82 S. Ct. 691, 7 L. Ed. 2d 663. At issue in Baker was a decades-old Tennessee apportionment. According to urban Tennessee voters, the outdated apportionment was a "silent gerrymander" or a "malapportionment." Although the population in urban election districts had increased, Tennessee had made no changes to reflect this population shift; thus, sparsely populated rural districts had the same representation in the state legislature as did densely populated urban districts. The Court in Baker did not reach a decision on the validity of the Tennessee districting; Baker established only that the issue of districting was Justiciable and not merely a Political Question. The Court next established the "one person, one vote" requirement for federal elections, in Wesberry v. Sanders, 376 U.S. 1, 84 S. Ct. 526, 11 L. Ed. 2d 481 (1964). This requirement, which held that voting districts should be roughly equal in population, was extended to the states in reynolds v. sims, 377 U.S. 533, 84 S. Ct. 1362, 12 L. Ed. 2d 506 (1964). In Wesberry, the Court struck down a Georgia redistricting statute (Ga. Code § 34-2301) because its voting districts were unequal in population. Georgia's Fifth Congressional District, largely populated by African Americans, was two to three times the size of other districts in the state. As a result, the African Americans in the Fifth District received less representation in Congress than persons in the other districts. According to the Court, this violated Article I, Section 2 of the U.S. Constitution, which states that U.S. Representatives were to be "apportioned among the several States … according to their respective Numbers" (Wesberry). Since these seminal cases, courts have become intimately involved in the review of apportionment, reapportionment, and redistricting. In their review of districting schemes, courts use census figures to compare election district populations for equality of representation. Courts also examine census figures for racial populations and compare overall percentages with percentages in election districts. Courts have developed redistricting principles that favor compact, contiguous election districts that respect already existing municipal boundaries. Gerrymanders may be easy to recognize because they usually produce election districts that are irregularly shaped. However, not all irregularly shaped election districts are the result of gerrymanders. Indeed, Congress has encouraged the creation of "majority-minority" voting districts, which often call for an inventive drawing of election districts. Majority-minority districts are those in which racial minorities constitute the majority of votes. Under section 4(b) of the voting rights act (79 Stat. 438, as amended [42 U.S.C.A. § 1973b(b)]), some states, or specified counties in some states, may need to preclear redistricting plans with the attorney general or the U.S. District Court for the District of Columbia. The states subject to preclearance are those that have historically used constraints such as poll taxes and literacy tests in an effort to exclude minority voters. Section 4(b) of the Voting Rights Act presses the issue of redistricting based on race. The Supreme Court has responded by questioning the constitutionality of the provision. In Shaw v. Reno, 509 U.S. 630, 113 S. Ct. 2816, 125 L. Ed. 2d 511 (1993), a group of white North Carolina voters challenged the creation of two North Carolina majority-minority districts, which had the approval of the attorney general. One of the districts at issue had the shape of a "bug splattered on a windshield" (Shaw). The other district was so thin in parts that one legislator remarked, "If you drove down the interstate with both car doors open, you'd kill most of the people in the district" (Shaw). According to the Court, the redistricting was a racial gerrymander because it could not be explained by anything other factor than race. The holding of the Court emphasized that redistricting based entirely on race, with no respect for other redistricting principles, was a violation of the Equal Protection Clause and therefore invalid. The Supreme Court reaffirmed and extended the Shaw holding in Miller v. Johnson, 515 U.S. 900, 115 S. Ct. 2475, 132 L. Ed. 2d 762 (1995). In Miller, the state of Georgia had complied with the redistricting provisions of the Voting Rights Act, but still found its redistricting scheme struck down by the U.S. Supreme Court as a racial gerrymander. As a designated state under the act, Georgia reapportioned three times before the attorney general accepted a plan. In its first two plans, Georgia drew two districts in which the majority of the voting population was African American. The scheme eventually accepted by the attorney general contained three congressional districts in which the majority of the voting population was African American. According to the Court, the redistricting was a racial gerrymander because its guiding principle was racial division, even though the new election districts were not bizarrely shaped. The controversy over the North Carolina redistricting plan considered in Shaw v. Reno continued throughout the decade, even after the Court's decision in Miller v. Johnson. Three years after the Court ruled in Shaw, a three-judge panel in federal district court in North Carolina reviewed the state's districting plan, but again found it to be constitutional. The Supreme Court reversed the decision for a second time in Shaw v. Hunt, 517 U.S. 899, 116 S. Ct. 1894, 135 L. Ed. 2d 207 (1996) and found that the redrawing of the district into bizarre-looking shapes violated the Equal Protection Clause. The North Carolina legislature constructed a new districting plan with a district 71 miles long, where African Americans comprised a 47 percent majority, compared with 57 percent in the original plan. White voters again contested the plan, and the three-judge panel in the North Carolina district court found that the plan violated the Equal Protection Clause because, according to the court, the legislature used race as a motivating factor in drawing the districts. The Supreme Court, per Justice Clarence Thomas, however, disagreed. In Hunt v. Cromartie, 526 U.S. 541, 119 S. Ct. 1545, 143 L. Ed. 2d 731 (1991), the Court held that the motivation of the legislature was in dispute. The white plaintiffs were required to prove that the district was drawn "with an impermissible motive." Moreover, the plaintiffs had to prove that race was the "predominant factor" motivating the legislature. The plaintiffs had the burden of showing, through direct and Circumstantial Evidence, this racial motivation. On remand, the three-judge panel conducted a full hearing to determine the intention of the legislature when it drafted the district. After the hearing the panel again ruled that the plan used race as a predominant factor, which is constitutionally impermissible. The Supreme Court reviewed the case for the fourth and final time in Easley v. Cromartie, 532 U.S. 234, 121 S. Ct. 1452, 149 L. Ed. 2d 430 (2001), this time concluding that the three-judge panel's findings were clearly erroneous and must be reversed. The Court held that a largely black district is constitutional if it is drawn to satisfy political rather than racial motives. The issues in North Carolina and Georgia are by no means unique to those states. In 1975, Congress enacted a law (Pub. L. No. 94-171) that requires the census bureau to provide redistricting data to each state after each decennial census, the last of which occurred in 2000. Between 1990 and 2000, the percentage of white Americans increased at a lower level than any other race or ethnicity, including African American, Hispanic American, Asian, American Indian, and Native Hawaiian. After the census figures were released, each state underwent a lengthy and costly process of redistricting, and many of these plans were contested in court. Redistricting raises not only racial and ethnic concerns, but also concerns over the political motivation of these plans. Some claim that the system has become one in which politicians, through redistricting, now choose their voters before the voters choose their politicians. Partisanship is often at the core of these controversies. For example, due in large part to Republican-drafted districts in Texas, the Texas House of Representatives in 2002 came under control of Republicans for the first time in more than a century. Texas courts and those in many other states saw numerous lawsuits filed contesting these districting plans, and these contests were not expected to end for quite some time. Clarkowski, Andrew J. 1995. "Shaw v. Reno and Formal Districting Criteria: A Short History of a Jurisprudence That Failed in Wisconsin." Wisconsin Law Review. Fuentes-Rohwer, Luis. 2003. "Doing Our Politics in Court: Gerrymandering, 'Fair Representation' and an Exegesis into the Judicial Role." Notre Dame Law Review 78 (January). Hamilton, Jeffrey G. 1994. "Deeper into the Political Thicket: Racial and Political Gerrymandering and the Supreme Court." Emory Law Journal 43. Harvard Law Review Association. 1995. "Voting Rights and Race-based Districting." Harvard Law Review 109. Lewis, Terrence M. 1996. "Standard of Review under the Fifth Amendment Equal Protection Component: Adarand Expands the Application of Strict Scrutiny." Duquesne Law Review 34. Stockman, Eric J. 1993. "Constitutional Gerrymandering: Fonfara v. Reapportionment Commission." Connecticut Law Review 25. Alternatively, if one can have an unconstitutional partisan gerrymander in a state with no pockets of particular partisans, we wonder if the state must abjure contiguous districting and use noncontiguous districting, where voters are placed in districts not by virtue of geography but by virtue of their party affiliation. In 2003, national media attention focused on the Republican-controlled Texas state legislature's extreme partisan gerrymander of the districting scheme used to elect Texas's congressional delegation. Moving to the district-specific gerrymander claims, the Court held that the Texas legislature's redrawing of District 23 violated section 2 of the Voting Rights Act. The legitimacy of the status quo is weakened to the extent it is based on a previous partisan gerrymander. Shape, though, is no longer as indicative of an attempted gerrymander. Consequently, statewide measures of partisanship are not suitable for demonstrating a gerrymander. In this situation, a systematic gerrymander can be detected when a party's median vote share is substantially below its average vote share across districts. 54) The predictable outcome under the standard was that a partisan gerrymander, at least of the common variety, could never satisfy the Bandemer standard short of the historically extreme malapportionment preceding the one person, one vote rule. We define an extreme partisan gerrymander as a redistricting plan that simultaneously violates two or more statistical tests (see sidebar, "Can Math Assist in Saving Democracy? Their analysis of data from other states revealed a partisan gerrymander in Maryland perpetrated by the Democrat-controlled legislature to freeze out its conservative rivals. GRIFFITH, THE RISE AND DEVELOPMENT OF THE GERRYMANDER 16-17 (Leon Stein ed.